Don’t Burn Through Your Data Plan. Most Websites Only want 1024 X 600 photos, about 1MP. In the interest of speeding up their sites, most software companies like dealer.com, cars.com or Autotrader.com and auctionSimplified.com only call for 1 megapixel photos, so they will compress the photo ultra large photo for you after you upload. But why wait for large files to upload when you can take smaller photos to begin with. 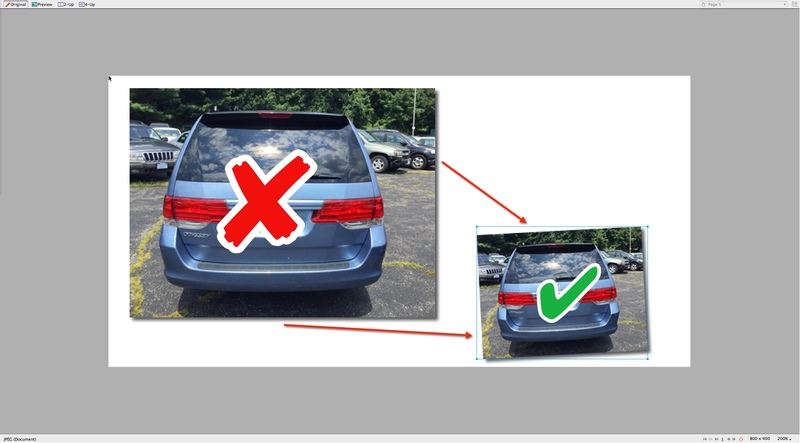 Simply Shrink the size of the photo before you upload it. Sounds easy, right? And it is on an android phone, simply Open your camera application, you will see the [Settings] icon in the bottom left – click [Select resolutions] and lower the resolution down to a smaller size. With the iPhone it is a little more complicated. The standard app does not allow you to lower the resolution, but luckily there are a bunch of Apps that have been thoughtful enough to allow it. I like “Camera Pro Plus” its $4.99 but its has boat loads of features. One advantage of Camera Pro Plus is you can exclusively use it for the vehicle photos and the regular iPhone camera for your regular photos. This way you don’t have to keep fiddling with the settings. You will notice a amazing speed difference when you upload the pix..